Vanity, Vanity… Does God Really Need to See a Veil to Recognize Piety? So... god [sic] needs to see a veil to recognize piety? Sorry, but this just seems really silly to me. Really, really silly. If you wear a veil or a hat or nothing at all on your head, what difference does it make? This is an excellent question. The short answer is no, God doesn’t need a veil to recognize piety. He actually doesn’t even need us, and yet He has chosen to create us out of love! However, we are human beings, body and soul. We are not purely spiritual beings. This means that what we do with our bodies affects our souls. We can sin with our bodies and the effect is harm to the soul. In the same way, what we perceive with our bodies - with our senses - affects our souls, too. Surely, you won’t tell me that going to eat at fast-food restaurant in shorts and flip-flops is the same experience as having a romantic candle-lit dinner in a beautiful evening gown, right? Our senses tell us that the latter is different… special. Likewise, symbols, though insignificant in and of themselves, become significant when they help our senses grasp invisible realities. A cross, though a simple wood figure, is more to us because it represents a mystery of our salvation. You might say, why wear a cross around your neck? Doesn’t God recognize piety without a cross? Of course He does, but it gives us a visible reminder of this reality. How does the chapel veil fit into all of this, then, especially when women haven’t worn it for decades*? Is it still a significant symbol for our time, or it is all just “really, really silly”? This love that St. Paul talks about - the love between husband and wife - reflects more closely than any other the passionate love God has for us: Jesus Christ, Son of the Living God, loves us with such intensity that He desires to enter our very being in Holy Communion. The Book of Revelation refers to this union with God as the “Marriage Supper of the Lamb,” and the Song of Songs also uses conjugal love as an allegory for the love between Christ and His Church. As further explained in this wonderful homily, we see that men are an image of Christ and women are an image of the Church, the Bride of Christ. 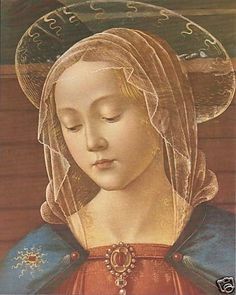 Considering the wedding veil is meant to be a sign of a woman entrusting herself to the loving care of her husband, it makes sense, then, that those who represent the Bride of Christ at the Eucharistic marriage feast would wear veils as a sign of her loving submission to the Bridegroom. When we are before Almighty God, truly present in the Holy Eucharist at Mass and reserved in the tabernacle at any other time, it is a time to call to mind these amazing realities. Sure enough, this is the same reason little girls wear veils at their First Holy Communion - they are little Brides of Christ, who are happy to submit to Him in love. This is also the reason behind the veil of women religious, who go above and beyond as to declare their whole lives as belonging to Christ, and thus wear the veil at all times. What type of head covering? If you are skeptical about the use of lace, recall that God himself gave specific instructions concerning the material to be used for the Ark of the Covenant, precious gold. I mention this not to say that God thinks we should use lace, but to point out that there is nothing wrong with preferring one material over another if its beauty seeks to compliment God on the sacredness of who He created. Vanity, on the other hand, "primarily seeks to show others what one has or has achieved" and is rooted in a disposition of the heart rather than in the object itself. Just as some could use a beautiful veil to seek the admiration of others, others could do so through the appearance of poverty. The objects are the opposite but the intention is the same. And since it is rooted in the heart, those who pronounce a judgment of vanity pronounce a judgment of the heart. All in all, the chapel veil is not “silly” nor the source of “vanity,” though some may judge it so. Rather, it is a sign of an invisible reality, namely, the nuptial love between Christ and the Church, His Bride, whom women represent. We wear the veil at Holy Mass and anytime we are in the presence of the Blessed Sacrament because it is then that we are present before the true, living, and substantial presence of God in a way that is not found anywhere else on earth. We are only human, after all...we are fallen, weak, and much in need of visible reminders of the mysteries of our faith. *Keep in mind that from the time women stopped wearing veils in the 60’s until 1983, knowingly or unknowingly, women who did not cover their heads in church went against Canon Law. In fact, the pro-abortion National Organization for Women published a defiant memo in 1968 encouraging women to send their veils to the national office to be burned (Religion Resolutions, N.O.W. Handbook, Dec. 1968). Related: The Best Remedy Against Vanity, Chapel Veils: Shouldn't We Avoid Drawing Attention to Ourselves?